Despite a few early experiments, augmented reality glasses have mostly remained the stuff of science fiction. But Bose is making its own attempt to enter this space with the launch of Frames glasses in the U.S. 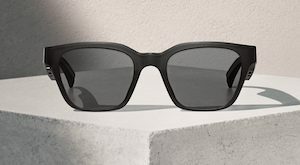 The audio-focused sunglasses contain speakers in the frame and microphones near each temple. Frames come with support for Siri and Google Assistant, although the only supported interactions are for music playback.